Photos are following the announcement .. through my shop antique filigree, I have at heart to offer a gallery of works and objects and authentic (no copy, fake or reissue) at prices really accessible. I take special care of my descriptions: you bid for what you see. The artist, post impressionist, is a member of the society of French artists. Very nice atmosphere for this great work in perfect state of conservation, signed by the hand of the artist. The frame montparnasse of time is sold with the work: for the single panel, without frame, count 260 euros. A very good large oil by amedee butcher. The artist worked extensively in the Alps and region of France and created beautiful landscapes opf the region in oil. The artist has over 200 recorded works on artprice and artnet. Title: the desert of apremont. Amédée boucher was a member of the society of French artists. He painted mainly forest pools, the banks of the Seine and rocks in fountain forest. Panel size: 54/65 cm, with frame: 72/85 cm. The shipping price includes the cost of transportation as well as the cost of supplies necessary for the protection of the work. The subscription of a delivery insurance. Remains the only remedy available in case of loss, theft or damage during the expedition. It remains your choice and your responsibility. For a purchase from abroad. Thanking you in advance for your trust. 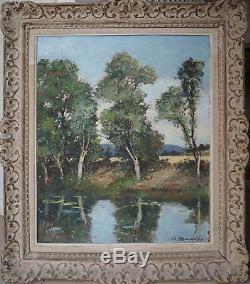 The item "table amedee boucher (1899-1960) pond in forest of fontainebleau + cadre" is on sale since Monday, November 13, 2017. It is in the category "art, antiquities \ art of the nineteenth and before \ paintings, enamels" The seller is "filigraneantiquite" and is located in Dijon, Burgundy. This item can be delivered anywhere in the world.